Santa Fe, CA (USA) -- Physics offers “crisper” analogies for meditation than traditional Buddhism does, said Fred Cooper, external professor at Santa Fe Institute and former program director for theoretical physics at the National Science Foundation at a lecture last night. Cooper, who has studied physics and meditation for over 30 years, spoke about connections between quantum physics and Buddhism in List 120 in a talk sponsored by the Brown Meditation Community. Buddhism and physics share a common “conceptual framework” consisting of “ground, path and fruition,” but they diverge in the specifics, he said. 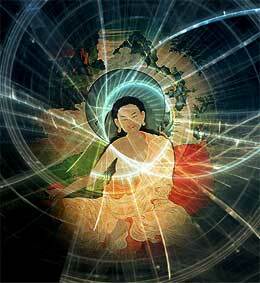 Physics is grounded in mathematical equations, while Buddhism is grounded in the rejection of a dualistic perspective. In physics the academic path involves learning algebra and other mathematics, while in meditation the path entails transitioning from mindfulness to awareness, he said. For physicists, fruition is winning the Nobel Prize, while for meditation, fruition is reaching enlightenment. In order to measure small quantities of space and time, physicists use high-energy light, which warps the measurements. As a result, when measuring on smaller and smaller scales, space and time “lose their meaning,” Cooper said. Cooper pointed to parallels between training in physics and training in meditation. “Neither discipline guarantees success. When you get your Ph.D. in physics, you learn all of the mechanics of physics,” he said. But whether a physicist makes a discovery that revolutionizes physics depends partially on luck, as does winning a Nobel Prize or attaining enlightenment. The book “The Tao of Physics” by Fritjof Capra popularized the similarities between modern physics and Eastern religious traditions. Cooper criticized the best-selling book for claiming physics proved ideas in Eastern religion were correct about the organization of matter. Because physics relies on an “evolving set of conceptual frameworks,” Cooper said, “The Tao of Physics” does not help either discipline. It compares the current state of physics to Eastern teachings, but the field of physics will likely change in the future, he said. Asked whether physicists show more interest in meditation or whether meditators show more interest in physics, Cooper said without hesitation that meditators are far more interested in physics. For physicists, “there is safety in being focused on solving equations, but you can’t solve how to live,” he said. About 80 students and community members attended the talk. “Meditation allows me to gather my thoughts,” said Henry Langton ’16. He added that he thinks there is a stigma against meditation but said this lecture and advances in neuroscience help justify the practice’s usefulness.